Microsoft is still struggling to figure out the best cadence for Windows 10 updates, a process that may result in fewer updates annually than once pledged, an analyst said today. "We haven't heard anything official, but the plan and the execution do not seem to be quite matching," said Steve Kleynhans of Gartner. "But that's kind of to be expected." Kleynhans was referring to talk the last two weeks that Microsoft may release only one Windows 10 update this year -- probably this summer -- pushing an expected second update into 2017. Several long-time Microsoft watchers, including ZDNet's Mary Jo Foley and the WinBeta website, have reported, via unnamed sources, that Microsoft will postpone a second 2016 update until sometime in the spring of next year. According to Foley, Microsoft will do that in order to sync with new company-branded hardware, specifically Redmond's Surface Pro and Surface Book devices. It's likely that there are other, more substantial reasons for a possible slowdown in the Windows 10 release tempo, Kleynhans argued. "They might not be able to meet the [former proposed] pace," he said of Microsoft. "There are lots of things internally that they need to do to make this work." Kleynhans had made that point before: Microsoft is as much feeling its way with the radical overhaul of Windows 10 development as customers are in accepting an accelerated release schedule. In its original Windows 10 release thesis, Microsoft said that it would issue three updates annually at roughly four-month intervals. It revised and rebuilt its update mechanisms to support that tempo, offering "branches" or release tracks, that would result in significant overlap. Enterprises might, under those plans, be dealing with as many as three or even four different versions concurrently, some of them as much as a year or more old, others just out the gate. Since that schedule was revealed -- in 2015, months before Windows 10's mid-year launch -- Microsoft has hinted at a slower cadence by repeatedly referring to the frequency as "two to three" times a year rather than the former formal standard of three times annually. A slower tempo wouldn't bother Kleynhans. "I'd rather see one that's good and solid, rather than have them rush things into the market," he said. "It's really going to come down to Microsoft finding the right pace," Kleynhans said. "That's what it's going to come down to: 'How do we produce enough new features quickly enough without harming the reliability of the software, but fast enough to appease people who want new and fresh?'" It might take Microsoft as long as two to three years to figure that out, Kleynhans said. And the clues about a slower rhythm signal that that process is now in the works. In the end, Windows 10's release schedule may be -- probably will be -- substantially different than the initial three-times-a-year plan. "There are lots of stakeholders, including Microsoft, other software vendors, hardware vendors and, of course, customers," said Kleynhans. "All of them have a say and a stake [in the release schedule]." If Microsoft does go with a slower schedule, Kleynhans added, "It's because that's what the market has ended up telling Microsoft." While there have been grumblings about Windows 10's faster release schedule -- primarily, but not exclusively, from enterprises -- Kleynhans was skeptical about exclusively attributing any go-slower decision to pushback from corporate clients. "There are two very distinct camps emerging: Customers who say 'I can't see how I can possibly keep up,' and others who say, 'We think we can manage it,'" said Kleynhans. The second group, though, is getting larger by the month, and fewer of Gartner's clients are throwing up their hands in despair over a faster tempo. 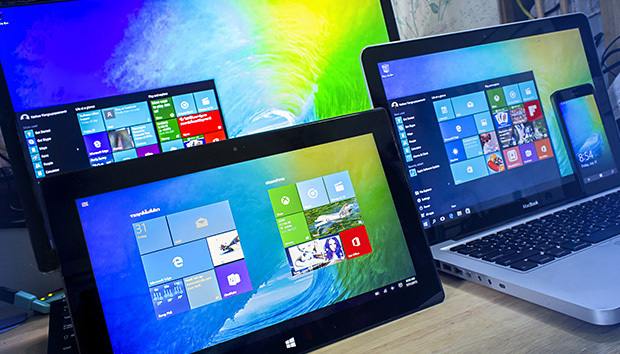 Even so, few will cry over a less-ambitious Windows 10 schedule, if that's what results. "Most [enterprises] would appreciate having to deal with just one update at a time, rather than having multiple updates in place," said Kleynhans. "So I won't be surprised if, for the seeable future, customers only have to deal with one at a time." « You want to help foot the bill for my data? Yes, please.